A series of guest blogs by Alex Ingle, resident filmmaker and photographer. As we’re now on a long transit/survey over Dogger Bank, I thought I’d use this time to give you an impression of the ship from the bridge right down to the engine rooms. It would probably be logical to start from the top and work down, but as I’m just about to go and grab a coffee and a bite to eat I think we’ll start in the galley. When I joined the James Cook for the first Britice-Chrono cruise, I think one of the biggest surprises (definitely the most pleasant!) was just how good the food was and the tremendous effort that goes into making sure everyone is catered for day and night. 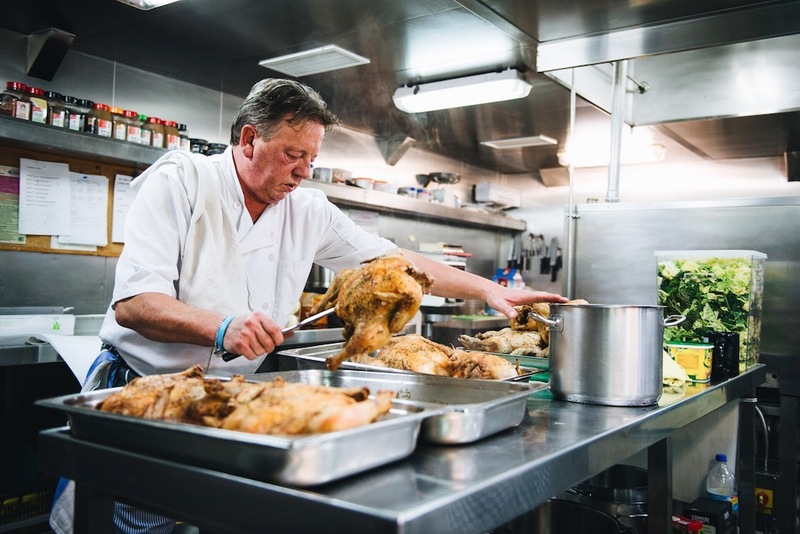 The guys in the galley are great, the team work hard to make sure nobody goes hungry. 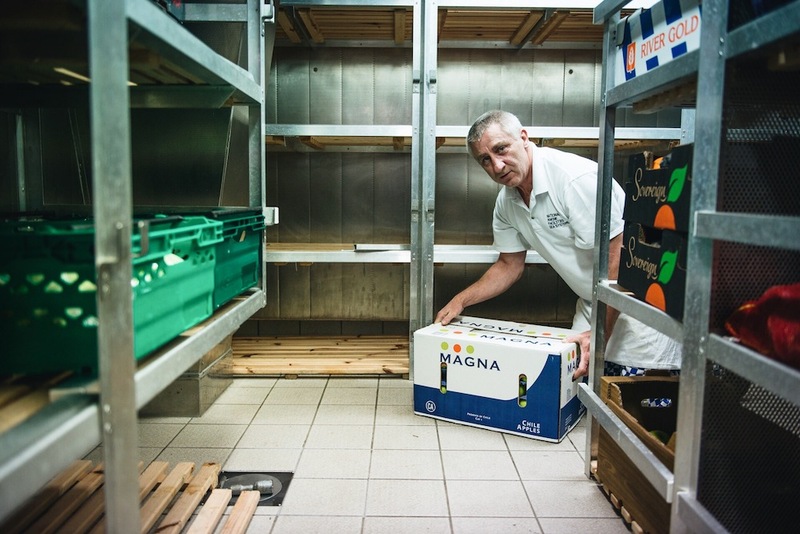 I’ve spent quite a lot of time behind the scenes here, learning about their work, picking up some culinary tips and having a snoop around the storerooms. The most interesting time I spent here was during a really rough patch of weather on the previous Britice cruise. 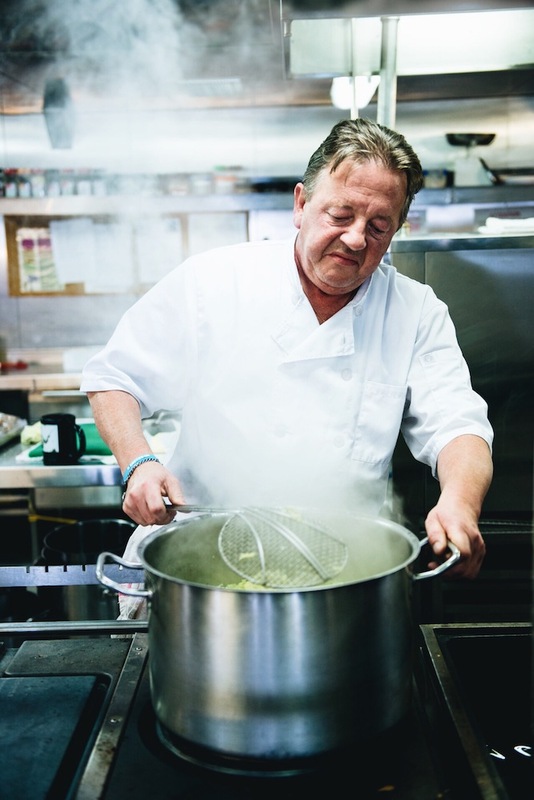 There was a pretty high swell as the tail end of a hurricane hit us, and I was up in the galley with Head Chef John and his team. 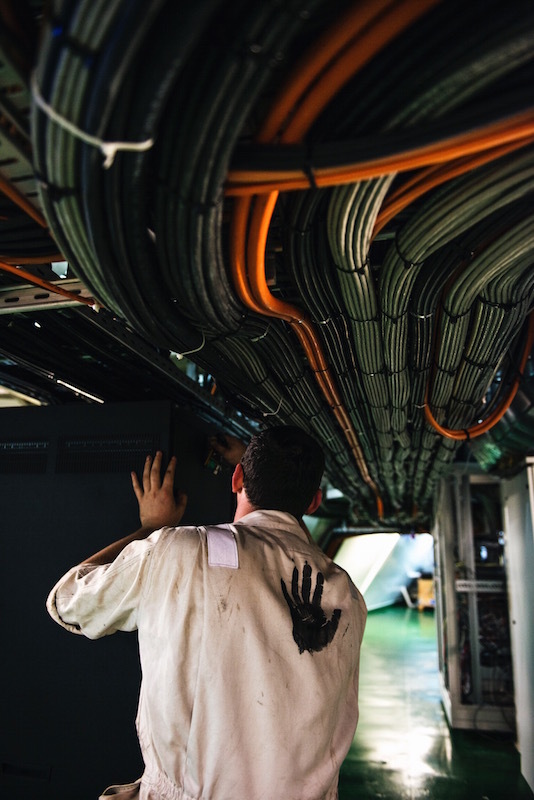 You might assume that being out on deck is the most dangerous place to be in rough seas, but when the ship’s being tossed around in a storm, and there’s pans of boiling soup, sharp knives and sizzling hot plates here there and everywhere – the galley can be one of the more intense places to work. 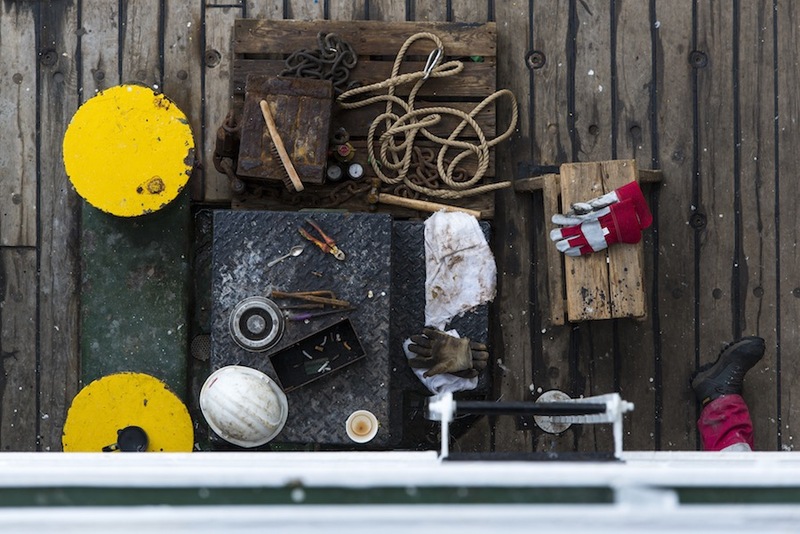 Unlike the aft deck, which, in the worst weather, might get closed off, the galley team’s work never stops. Everyone relies on these guys. If you wander down the ship’s corridors towards the ‘Forecastle’ deck, and keep heading up the stairs you’ll reach the bridge. As one of the most advanced research vessels currently in service it’s no surprise that stepping onto the bridge feels like you’re walking onto a Star Trek set… especially at night. A splash of colour around the main console. The Captain and his officers oversee all operations from up here, with each decision and observation made out on deck or in the labs being relayed to the bridge deck via radio. The views from up here are fantastic, and it’s by far the best vantage point for spotting wildlife. For that reason, it’s where the Marine Mammal Observer (MMO), Marian, also spends most of her time. 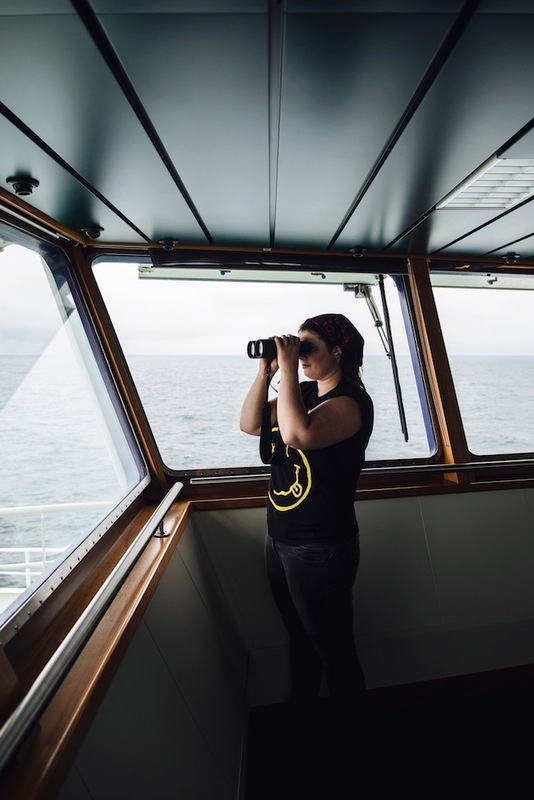 She’s got the somewhat enviable task of keeping lookout for any marine mammals and conducting surveys to ensure their protection. In my downtime it’s nice to do some wildlife spotting, and Marian is always the best person to go to for the latest updates. Marian, our MMO, on lookout for marine mammals. Above the bridge, up a very steep set of stairs, is one of my favourite spots on the ship. 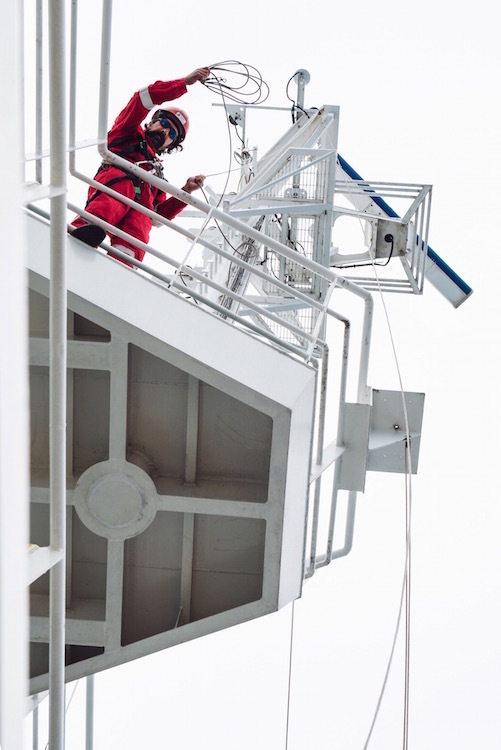 There’s a small deck which holds some of the ship’s radio masts, and it’s just about the highest point I can get to with my camera gear. It gives you an excellent vantage point for the ‘vibrocorer’ on the aft deck, and it offers panoramic views of the ocean. I came up here one night recently during fantastically clear skies and saw two shooting stars… pretty impressive stuff. From above or below, the top of the ship offers a unique perspective. Head back down a few flights of stairs, take a few turns here and there down to the science bunks, and wander through an inconspicuous door or two and you’ll find yourself in the engine control room. The engine room as seen from the control room. The engine room is a fascinating place for me; when you’re up on deck it’s very easy to forget what’s down here in the belly of the ship. 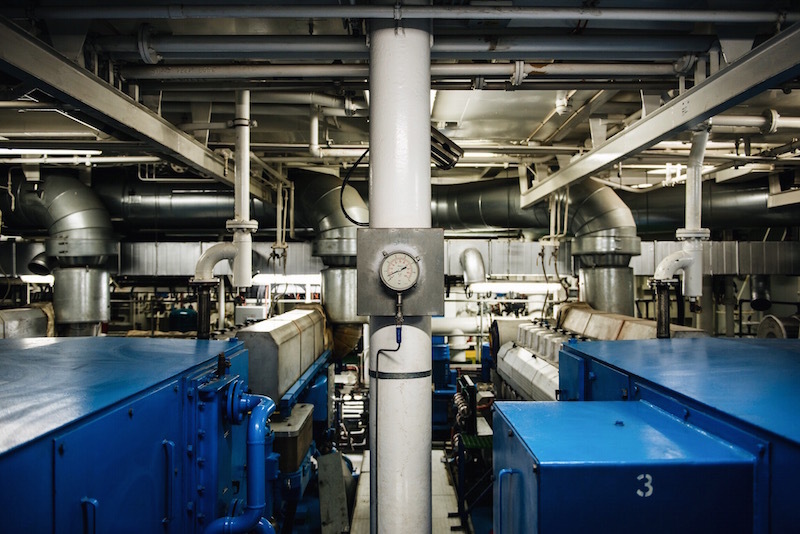 It’s an incredibly loud place with machinery everywhere, you need to duck and skirt around pipes, and navigate through watertight doors everywhere you go, and there’s the ubiquitous smell of diesel. There are no portholes and it’s quite disorientating when the sea is rough; it’s an assault on the senses, but a photographer’s paradise! Miles of cables require regular checks. Of course, it’s a really dangerous part of the ship that demands utmost care. I feel privileged being allowed to explore down here, but as I mentioned before – with noise cancelling earmuffs and camera gear in hand, it’s a tricky place for me to work. 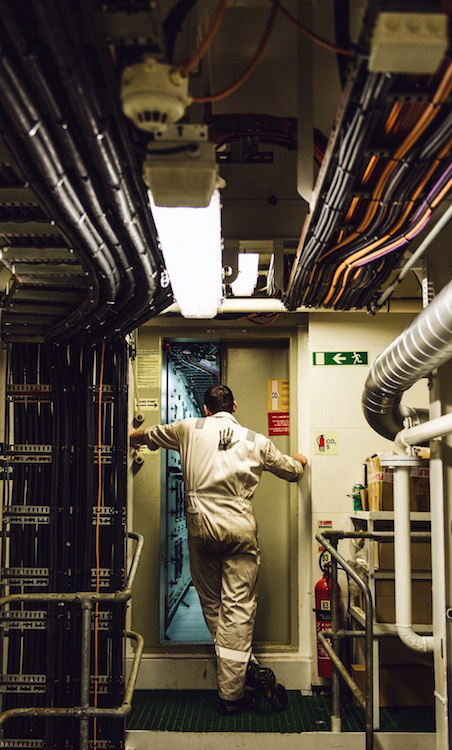 Before you’re allowed to set sail, you need to attend a safety briefing and by far the most harrowing pieces of equipment for all visitors are the watertight doors. They are extremely heavy mechanical doors that are used to prevent flooding from one part of the ship to the other in case of an emergency. During your briefing you see various gory images of accidents involving these doors – you operate them with a lever and they move pretty slowly, but you most certainly don’t want to take any risks when stepping through them! I find most visitors (including myself) try to avoid using them where they can, but down in the engine rooms they’re a necessity. I’ve become pretty used to them now, but I have to admit the hairs on the back of my neck still tingle when I have to put my arm through to hold the lever as I step through these automatically-closing doors. Heading back up a few flights of stairs, past the science teams cutting and analyzing cores in the ‘wet lab’ and through the ‘hanger’ and you’re on the aft deck. This is where I spend the majority of my time, trying to capture images in the heart of the action. All hands on deck as the vibrocorer requires attention. This is where all of the ‘hands on’ science happens. Here the crew, the British Geological Survey (BGS) engineers and the science teams work together to operate the ‘vibrocorer’ and ‘piston corer’, which are lowered into the sea to retrieve samples from the ocean floor. It’s another fascinating area for photography, and it’s a great feeling standing out here in the bracing sea air as seabirds fly past. 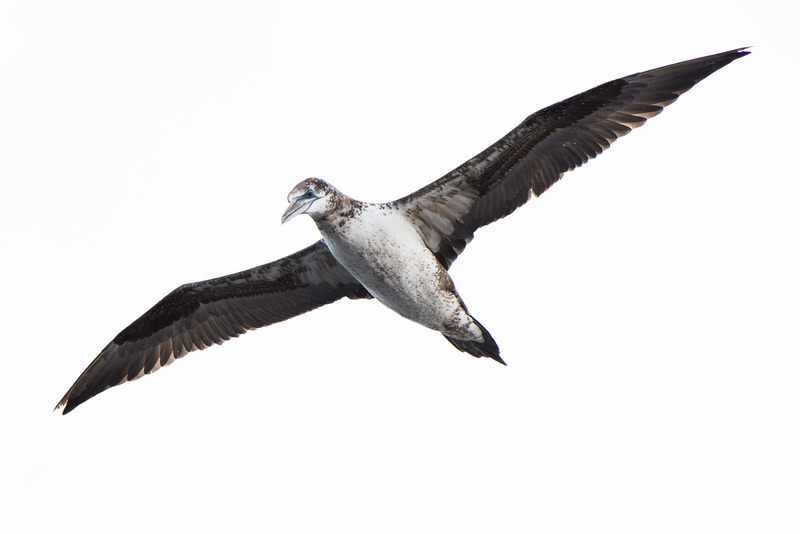 A young gannet soars above the aft deck. John sends tools up to a colleague on the a-frame above before carrying out some maintenance. I’m out here a lot, straddling different shifts at different times to capture a true picture of life on deck. As soon as night falls, it becomes a totally changed place. Floodlights light the deck, illuminating seagulls in the darkness as they speed past. As the ship bobs up and down, and there’s darkness as far as the eye can sea, looking over the side is quite an eerie but humbling experience. You try not to think about ‘what if’ but inevitably end up considering how different it would be out there compared to a well lit and pleasantly warm swimming pool where you do your marine survival training. Activity on the aft deck, much like the rest of the ship, revolves around the scientific operations. It’s a hive of activity once we’re about to deploy/retrieve the corers; teams appear from every corner of the ship and it’s all go, but during transits between sites it can become really quite deserted. The crew return inside, the BGS engineers disappear into containers to service equipment, and the science teams head to the labs. There’s a very set routine on board, and it’s really interesting being able to observe it – at times, especially during longer transits, there might only one person left on deck… and that’s usually the lone photographer! 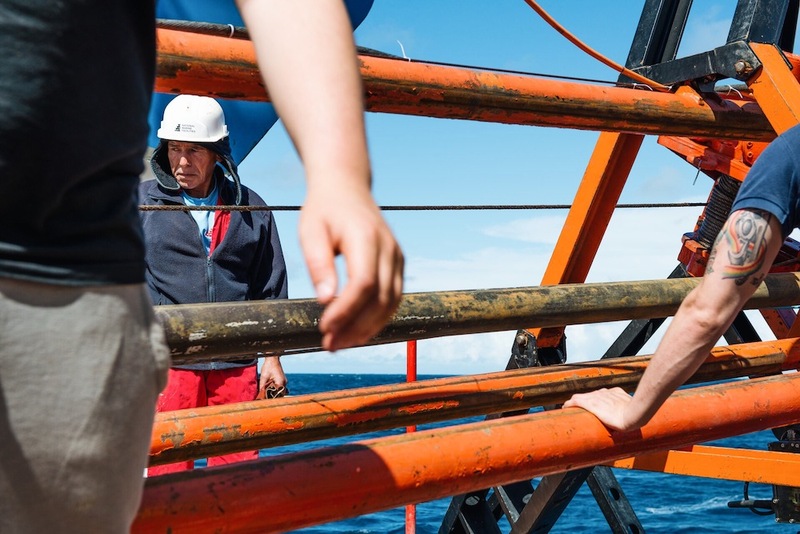 John passes ropes up to his colleague while the Vibrocorer is on deck. Of course, the quietness is always short-lived and before you know it, the crew reappear, ready to redeploy. One thing that strikes me about everyone on board, especially the crew, is the importance of positivity. A good sense of humour is a key attribute for anyone working at sea. When you’re living in a confined space, working in a hazardous and strenuous environment with the same people, day in day out for weeks or months at a time, humour diffuses tensions, passes the time and helps teams work together. 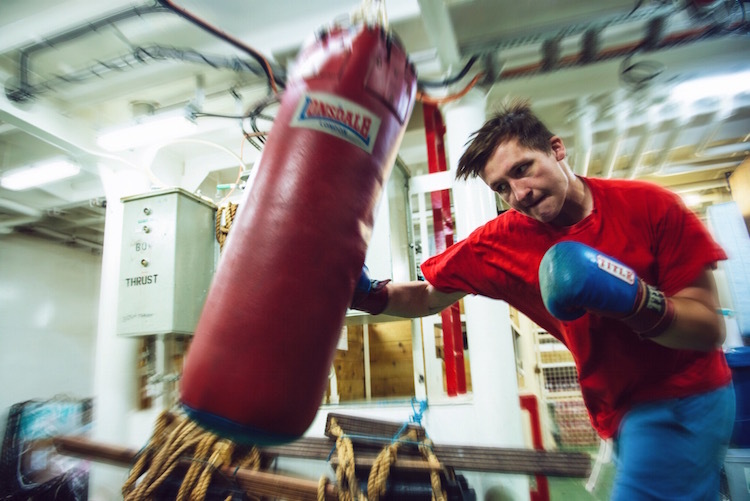 That means there’s always a lot of good ‘banter’ out on deck, and for days when humour doesn’t quite cut it, there was always the punch bag hanging in one of the storerooms! When the gym is too busy, or when rowing and running just won’t cut it, there’s always the punch bag. Now to where the science happens – the ship’s labs. Head back in from the aft deck, through the hanger, and the first of these is the ‘wet lab’. Where fresh cores are processed. Head through there and down a corridor and you’ll reach the ‘dry labs’ where banks of computers and geophysical equipment are being studied meticulously, and, if you time it right, there’s usually a slab of Toblerone or a packed of Haribo being shared around…! At the back of the dry lab, a CCTV station allows you to keep an eye on things. Before I wrap this up, I should point out that one of the reasons I love what I do is my clientele. Scientists (at least the ones I’ve met) tend to be very positive, welcoming and down to earth people, so it’s a pleasure dealing with them on a day-to-day basis. Part of the science team back at the start of the cruise. One reason why this area of photography/filmmaking was a natural progression for me, is it followed on from my own scientific background. Having studied glaciers in Iceland and Greenland during undergrad and postgrad research, I have a fairly broad understanding of a lot of the topics that the Britice-Chrono team are investigating. This is essential for knowing when and where to shoot, and definitely helps me understand the teams’ enthusiasm for mud! This entry was posted in Uncategorized on July 28, 2015 by alexingle. The last week has seen the start of the epic trek north to south from Shetland to the Dogger Bank in the southern North Sea. We spent the first 2 days looking at some enigmatic grounding wedge features on the sea-floor just west of the Norwegian channel where the British and Norwegian Ice sheets battled it out for supremacy during the last cycle. We also stepped boldly into the unexplored world of outburst floods and drowned coastlines with a some incredible seafloor geomorphology adding to the ice sheet story in relation to the uncoupling of the two ice sheets. Unbelievable geomorph! From the Norwegian Channel we headed SW towards the Moray Forth running a 100mile survey and coring transect NW to SE over a spectacular series of moraines before heading into the central North Sea and the urban heartland of the North Sea oil fields around Shearwater and Erskine. Our goal was the Great Fisher Bank (that renowned last bastion of the British Ice Sheet) where we enjoyed a cracking day out sampling Holocene sand and the arrival of a racing pigeon called Terry from Thurso. Needless to say, Terry proved more interesting than the seafloor that day! The great odyssey to the Far East was followed by 3 epic days surveying and coring east of the Firth of Forth and then down the east coast from Berwick to Sunderland chasing the imprint of the North Sea lobe. Moraines, deltas, eskers, outwash fans and tunnel valleys littered the bed of the Forth system; all soaked in metres glorious glacial sediment. Better was to follow as we moved south along the Northumbrian coast with the resplendent Whin Sill fracturing the seafloor and grounding zone wedges plastered on to the bedrock. There were also superb, quiet seafloor basins revealing the multi-coloured, muddy barcodes of the deglacial story of the Forth, Tweed and Tyne Ice Streams. The final push now. One week to go and on to Dogger Bank for the next two days. Can we prise out the some glacial secrets from beneath that sandy veneer? Huge sand banks seem to guard its peripheral moat warning against trespass, but we are committed now and on to its shallow, upper surface. Our early cores are showing promise; we will see. Hopefully, our target sites in the Humber and Wash area will bring a pot of glacial gold at the end of a cracking month at sea. Then home. This entry was posted in Marine geology specific issues and tagged Cruise, Dogger Bank, Doggerland, Marine, multibeam, North Sea, OSL, Pigeon, RRS James Cook, sampling, T2 Transect on July 27, 2015 by briticechrono. 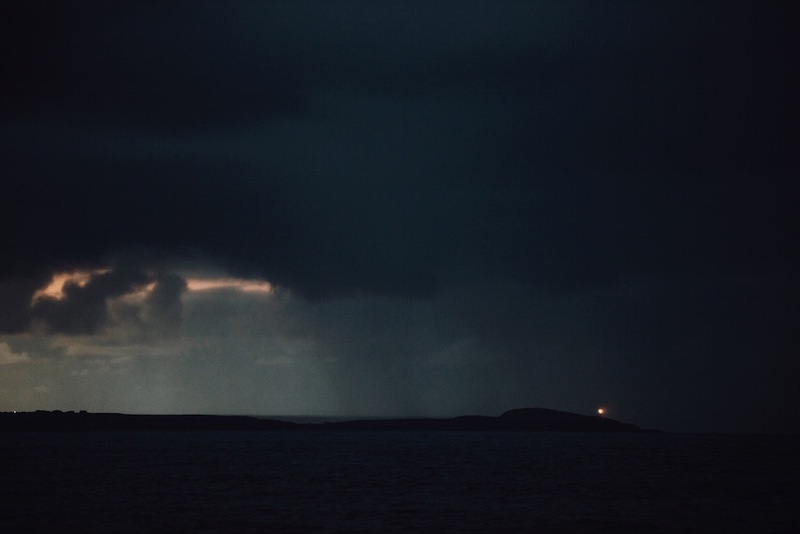 The last time we ventured into Shetland territory it was in pursuit of far-travelled rocks laid down by the last ice sheet, strewn across hard-to-reach islands – Foula, Papa Stour, Out Skerries, to name just three. Our successful 10 island-tour of Shetland took place in 11 carefully planned days in May last year, when the 6-strong team worked from dawn til dusk to ensure that they didn’t return home empty handed. Those precious rock specimens have since been analysed at Glasgow University; their exposure age is helping to unravel the ice sheet history of Shetland and the surrounding area. 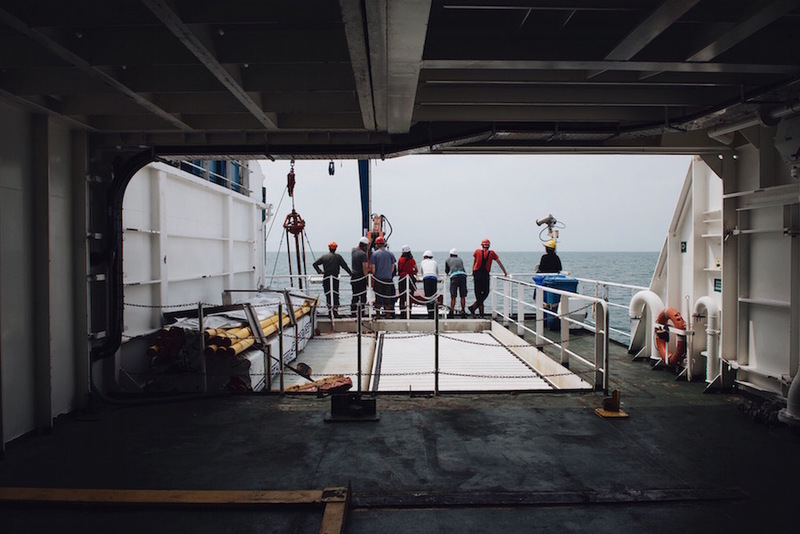 This time the Britice-Chrono team are on the high seas, aboard the RRS James Cook, looking for glacial seabed mud and ice sheet imprints along the extreme edge of NW Europe, from the Outer Hebrides to the Norwegian Channel. In this part of the UK, in July (at 61.5 degrees N and still within the offshore Exclusive Economic Zone) dusk stretches beyond midnight and the sun reappears before 3 am, after only the briefest of nights. That being said, working on the night shift is still a challenge. The geophysical data collection and seabed coring programme on the James Cook works 24/7. 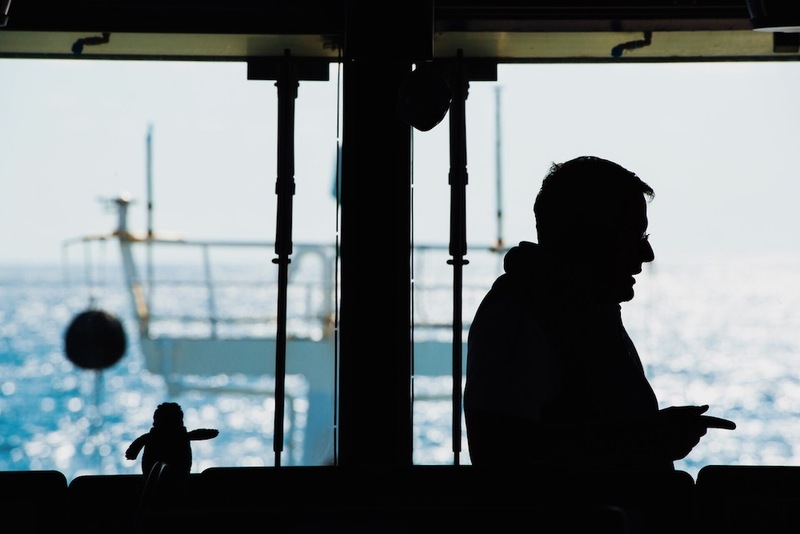 The ship’s crew operate on 4-hr ‘watches’, and the science team are divided into day and night shifts (8am to 8pm) to allow around-the-clock working. Punctual, brief, morning and evening meetings allow seamless handover between shifts, an update on the day’s progress, and an all-important weather forecast for the next 48 hrs. Day and night shifts for the science team are similar in content but different in the details. Apart from the darkness, the cold, the nocturnal fatigue and the daysleeping, we have dinner for breakfast and sometimes breakfast for dinner; which mixes up the body’s normal everyday cycle and turns the daily routine on its head. But after 2 weeks on the night shift, having a roast beef lunch at midnight seems almost normal. Although going to bed when the sun is at its warmest will never feel quite right to me. And the AM vs PM confusion is always there, nagging away. 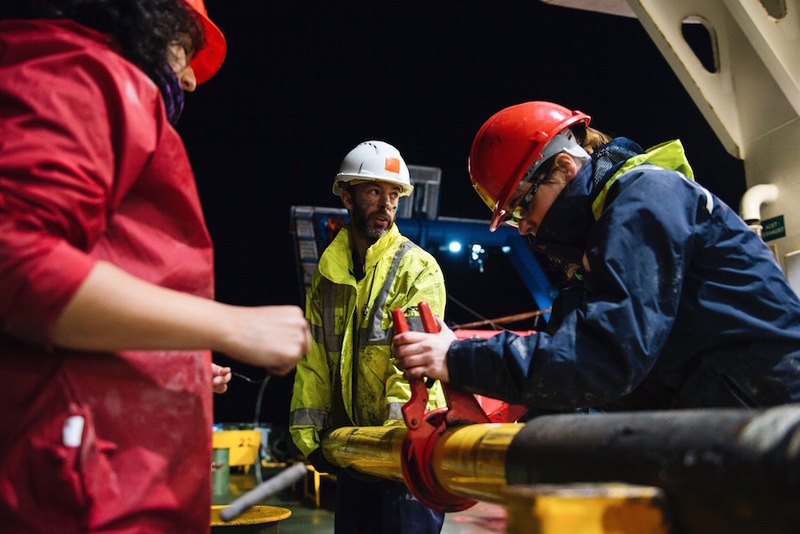 As we collect geophysical data, recover seabed samples and describe cores well into the night, the daysleepers perform the same rituals as the nightsleepers but just in a different time zone. We say ‘good morning’ to people instead of ‘goodnight’; we cheerfully get down to work on Wednesday night and carry on into Thursday morning; we relax on deck after some ‘early evening’ exercise; and drink a beer instead of pouring that first cup of coffee. But perhaps my favourite bit is not really ever knowing what day of the week it is. Waking up after a full ‘night’s’ sleep to find it’s still the same day as when you went to bed. Confusing, but curiously liberating! Anyway, back to the science. Yesterday’s leg of the cruise took us 60 nautical miles (or roughly 111.11 kilometres) north of Muckle Flugga lighthouse, Shetland’s northern tip – a point on the Greenwich meridian still in UK waters but on the same latitude as Narsarsuaq Glaciers in east Greenland and Suduroy in the Faroe Islands. We took 9 seabed cores during a 12 hour transit back towards Shetland, each one penetrating different sediment, and each one hopefully holding its own clues as to when the last ice sheet retreated and when sea levels rose. The spectacular sequence of moraine ridges on the seabed NE of Shetland is unique within the British Isles, both in its unusual shape and the number of landforms preserved. Although we’ve known about the moraine pattern for a while, and what it means for the last ice sheet to cover Shetland and the northern North Sea, the age of these features remains elusive. What we find when we analyse these cores will hopefully help clear things up. 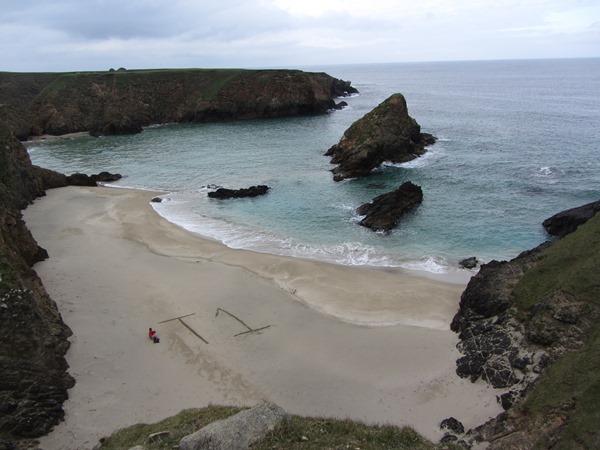 This entry was posted in Marine geology specific issues, Terrestrial geology specific issues, Uncategorized and tagged briticechrono, Cruise, glaciation, Marine, marine sampling, RRS James Cook, Shetland, T1 transect on July 17, 2015 by briticechrono. A new perspective on things. Now that we’re done with introductions (blog here), and as we’re just about at the halfway point of the cruise, I thought I’d share some insight into life on board the ship from a photographer’s perspective; what it’s like being the ‘odd one out’ and some of the unique challenges that this environment presents me with. Docked in Southampton, getting some final shots on the evening before we left. Life on board a research ship is a 24/7 operation, there’s always something happening, people are always working, and there’s always a photograph opportunity or two. This is the first challenge for me, whereas the science teams and crew have set shift patterns that rotate every 12 hours, I’m in charge of my own schedule and must decide when and where to photograph. 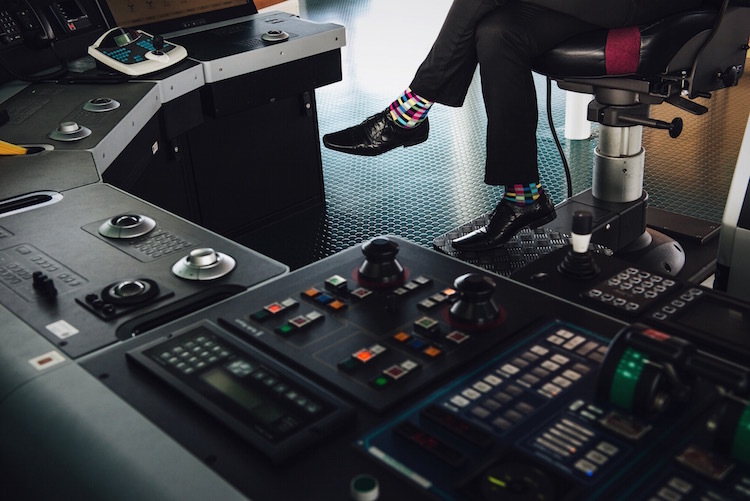 I could choose to only shoot on blue-sky days for a few hours and spend the rest of my time with my feet up, but this wouldn’t be a true representation of ship life (and, honestly, it wouldn’t be much fun). In order to portray a more realistic picture, and to document the ups and downs which come with this line of work, it’s my job to experience both day and night shifts, across the whole ship come rain or shine. This far north, when the sun rises early; the photographer stays up late. 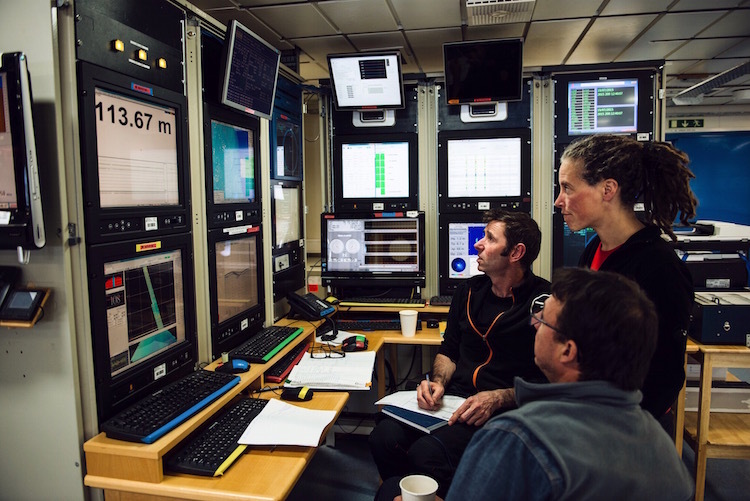 Sometimes I’ll be out on deck at night – sitting with the crew as they exchange stories during horizontal rain, watching the science teams jump into action as fresh cores are hauled up from the sea floor in the early hours. 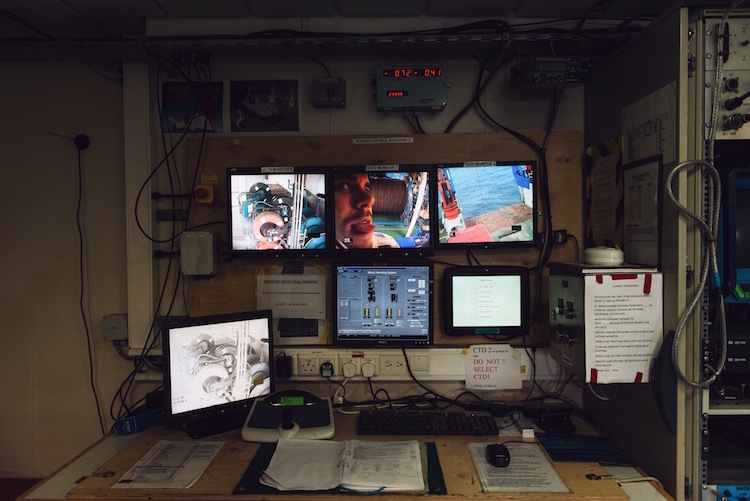 At other times I follow the day shifts – the chefs and porters in the galley, the engineers beneath deck or the science teams processing cores in the labs. Some days I do a bit of both. It’s an intense environment, especially when the weather takes a turn for the worse, and making sure that I’m always in the right place at the right time to get the shot is a constant challenge, as is making sure I get enough sleep in between it all! Vibrocorer repairs on the aft deck. However, by far the biggest challenge for me revolves around safety. Shooting an assignment in a complex and dangerous offshore environment requires much more consideration than most of my work on dry land. Traversing glaciers, or navigating gorges whilst following scientists isn’t without its dangers, but here on the ship you really have to stay on the ball at all times. This is particularly challenging as a photographer/filmmaker coming into an environment like this for the first time. 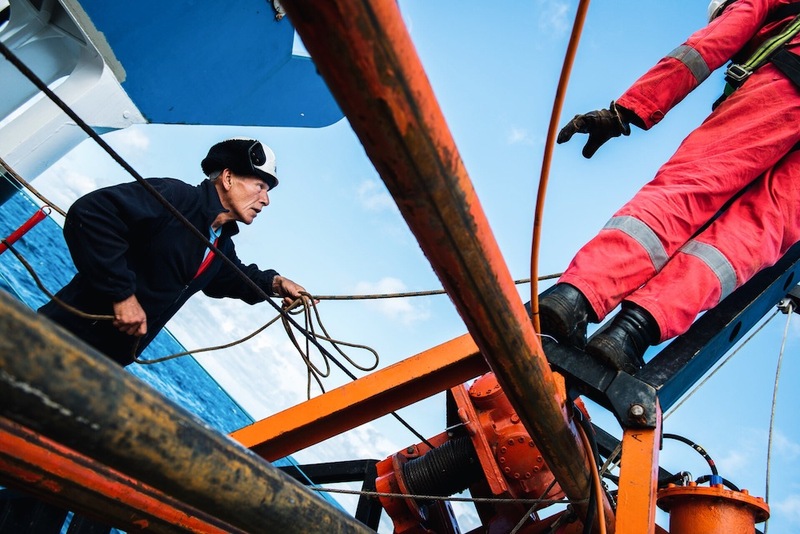 Now I have the benefit of last year’s offshore experience, but when you first step on board it’s not difficult to get caught up in a shot without realising that you’re in danger of falling overboard or getting caught in a winch cable. With ‘viewfinder vision’ it’s all too easy to forget what’s happening around you while you’re focussed on getting the shot. You find photo opportunities wherever you look, but you have to have eyes on the back of your head, and be completely aware of everyone and everything around you. This is especially the case beneath deck in the engine rooms. Down there you wear noise-cancelling earmuffs, it’s deafening without them. Losing one of your senses makes a dangerous place even more so, particularly when navigating through watertight doors and past moving machinery. But, if you keep your wits about you, listen to the advice of the crew, drink plenty of coffee and make sure that when one eye is behind the viewfinder, the other is always focussed outside the frame, then it’s a thrilling place to work. Another challenge that springs to mind involves capturing 24/7 coring operations on film. Being immersed in this environment, it’s easy to get a sense of scale first hand, but it’s quite a logistical and technical challenge to capture that on film for others to see. 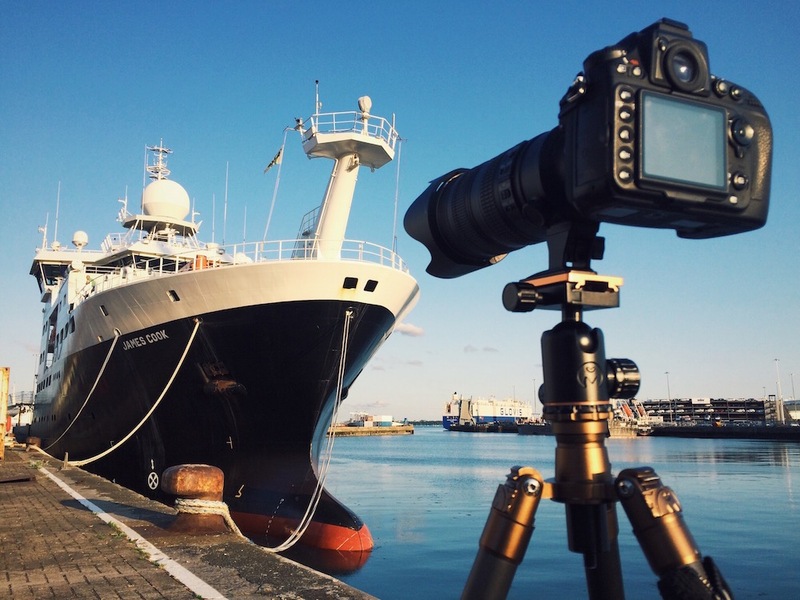 The fairly straightforward task of shooting time-lapse sequences suddenly requires a lot more thought when you’re on a ship. In addition to the usual technical considerations, you need to consider how high the swell might get, strapping everything down with cable ties and ballast and making sure it’s protected from the elements. I don’t attempt these long time lapses very often out here largely because of the impact it has on my sleep – I tend to lie in bed imagining my gear out on deck sliding overboard, and end up checking on it every hour throughout the night. I haven’t (yet!) encountered any major issues but since I shot a few successful 24-hour time-lapse sequences of ‘vibrocoring’ on JC106 last year… I don’t think there’s any need to tempt fate (or disturb my sleep) this time around! This entry was posted in Uncategorized on July 16, 2015 by alexingle. Darkness. A great mass of ice overhead. The eerie rumbling of a large, uncompromising mass, slowly but steadily on the move. Below a thick layer of stiff red sediment, ground off the red bedrock, crushed and churned into a lumpy, sticky blanket of glacial till. What would later be called Cape Wrath was only miles to the south, but there was no cape yet. Just the grinding of slow and unforgiving ice moving north into the North Atlantic. But the times were changing. The sun gained in strength, atmosphere and ocean started to warm and the gigantic ice mass, later to be known as the British-Irish Ice Sheet, was in decline. As its surface melted, more water reached its bed, and it began to slide helplessly over its own sediments. Slowly it thinned, and retreated in the direction of the Scottish mountains with the ocean lapping relentlessly at its edges. There seemed to be no hope, but the ice sheet made one last bold dash towards the edge of the continental shelf before it faltered. The recently deglaciated seabed and freshly deposited grey ocean sediments were bulldozed and overrun again by ice on the move, and buried once more in a blanket of red till. Linear ridges (moraines) marked the limit of this temporary re-advance. But it was only a death throw; the re-advance didn’t get far. The ice sheet’s days were numbered. The advance stopped, and turned into irreversible retreat. A geophysical search for the perfect core……. Against a backdrop of rumbling, calving icebergs, station JC123-048VC slowly became ice free, as the snout of the ice sheet moved back over the site. A cold, shallow sea took its place; first, still close to the snout of the ice sheet, where streams of meltwater rushing into the waiting sea water lay down a blanket of coarse sand. As the ice retreated further, taking the meltwater streams with it, the sea fell silent. Only fine sediments spat out into suspension by the dying ice sheet made it to our site, slowly covering it in a thick, grey blanket. The ice sheet sent a final message as the ice margins retreated south towards the land; a message from an iceberg. As it passed, melting, overhead of station JC123-048VC, pebbles slipped from its icy grip. They plummeted into the depths, impacting into the soft fine clay sea bed. As soon as this excitement started it was over, and the pebbles were slowly covered by more of the same grey clay. With the great weight of the ice gone, the Earth’s crust rose like an ancient giant from its slumbers, pushing the Scottish continental shelf closer to the sea surface. 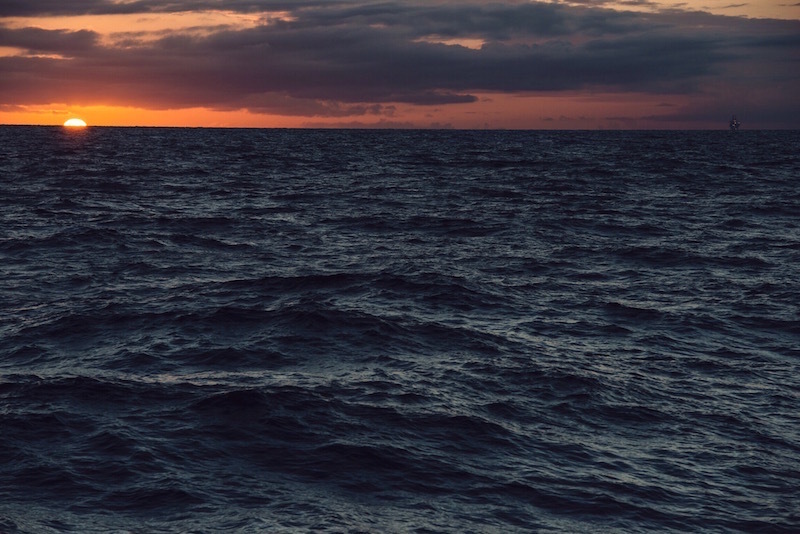 Over time, the waters shallowed, and the seabed currents became stronger. The last vestiges of the glacial seafloor were scoured by contour currents, which deposited the spoils of an energetic coast on the eroded sediment below. Millennia later coarse sand and shell debris formed a layer of several inches thick. And then on Sunday the 12th July 2015 all changed. There was an unfamiliar thud, and then the uncanny sensation of a vibrating tube burrowing into the sediment from above. It cut through the sand in a jiffy, passed the pebbles, and into the soft clays. The tube slid through it like a hot knife through butter. No struggle with the coarse sands lain down by meltwater streams either, only slowing on reaching the stiff, red till. It battled its way into it for a meter and a half. Then the friction became too much. The vibrocorer stopped, and then the whole tube, now full of sediment, was pulled back up to the sea surface, and hoisted back up onto the deck of the RRS James Cook, the ship it had come from. Peace returned once again on to the sea floor, at core site VC123-048VC, a few miles north of Cape Wrath, on the northwestern edge of Scotland; a land mass now devoid of ice sheets and glaciers. The core came on board and was cut into sections, labelled, scanned, and split. Finally, we, the scientists who had planned the project, planned the cruise, sailed all the way from Southampton to Cape Wrath, and waited for the British Geological Survey (BGS) to deliver the core, first laid eyes on the sediment. The story was there: a stiff basal till deposited beneath the ice sheet; fines marking the first incursion of the sea; further glacial till documenting the ice re-advance, meltwater stream sediments deposited in front of the retreating ice margin; the fine clays deposited when the ice began to recede southwards containing drop-stones from the icebergs, and the marine sand of the modern seafloor. That was what we had come for. And this was the 48th core; none of the previous 47 had told the story of the vanishing British ice quite this clearly. Hopefully we’ll be getting more cores like this in the coming three weeks of the cruise. We need this story told in every sector of the British-Irish continental shelf. Only then will we have what we set out for: the complete saga of the Last British-Irish Ice Sheet. This entry was posted in Discussions of science, Geochronology specific issues, Marine geology specific issues and tagged BGS, briticechrono, Cruise, geochronology, geophysics, glaciation, ice stream, Last Glacial Maximum, Marine, marine sampling, RRS James Cook, sand and gravel, sandur, Transect 8 on July 15, 2015 by briticechrono. 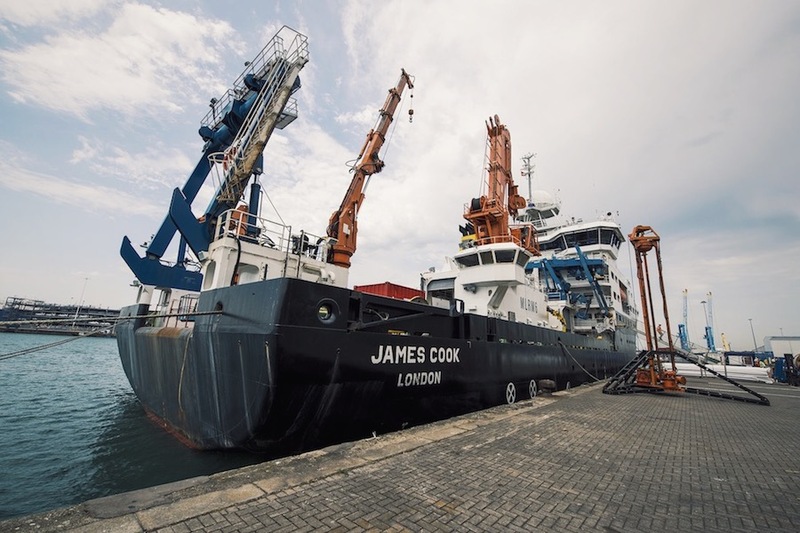 We, the science crew of RRS James Cook Cruise JC123, sailed from Southampton Friday 3rd July bound for the last three transects of the NERC funded Consortium Britice-Chrono, our aim is to work out the timing of the last deglaciation of Britain and Ireland. After a quick stop outside the Solent to test the BGS vibrocore we made hast (10 knots) northwards through the North Sea running geophysical surveys for the North Sea sector (Transect 2) as we went, and in the early hours of Monday 6th July we rounded the northern tip of Scotland on schedule for our speedy (19 knots) tide-assisted passage through Pentland Firth between Orkney and the Scottish Mainland onwards to Transect 8 and the delights of the Minch palaeo-Ice Stream extending north from Skye between the Scottish Mainland and the outer Hebrides towards the edge of the continental shelf and the North Atlantic. The Minch seaway ~28-25,000 years ago received ice flow from the major fjords in NW Scotland feeding palaeo-ice stream, which extended north and northwest across the continental shelf. This ice stream dominated the northwestern sector of the British Ice Sheet (BIS). The land- and sea-scape probably developed over multiple glacial episodes, but the sea floor landforms and uppermost geology reflect the most recent deglaciation after 25,000 years ago. The aim of Britice-Chrono is to work out the timescale for this deglaciation, and this has involved fieldwork on land, dating outwash deposits on the Isles of Lewis, Skye and on mainland, and glacially eroded bedrock and boulders across the region. 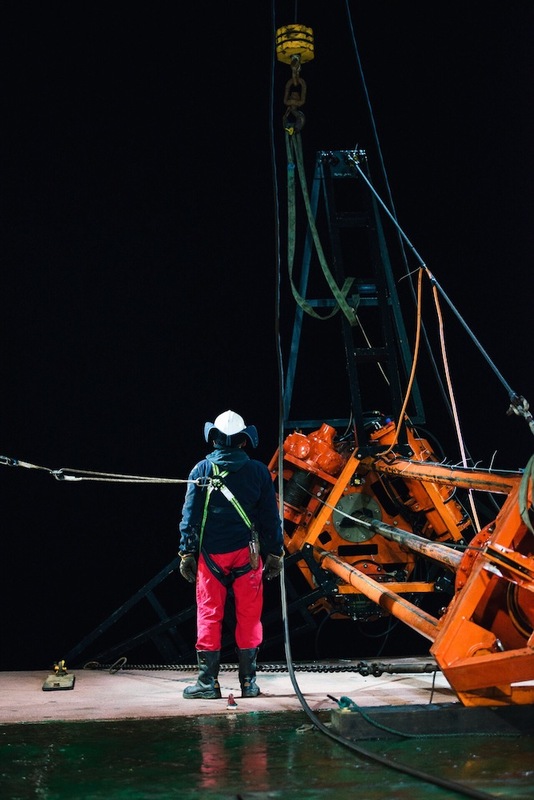 The offshore phase of this research has occupied us, so far, for the last seven days and nights, and involved surveying the sea floor for the morphology and the sediments using acoustic sounding techniques, but critically sampling the sea floor sediments. 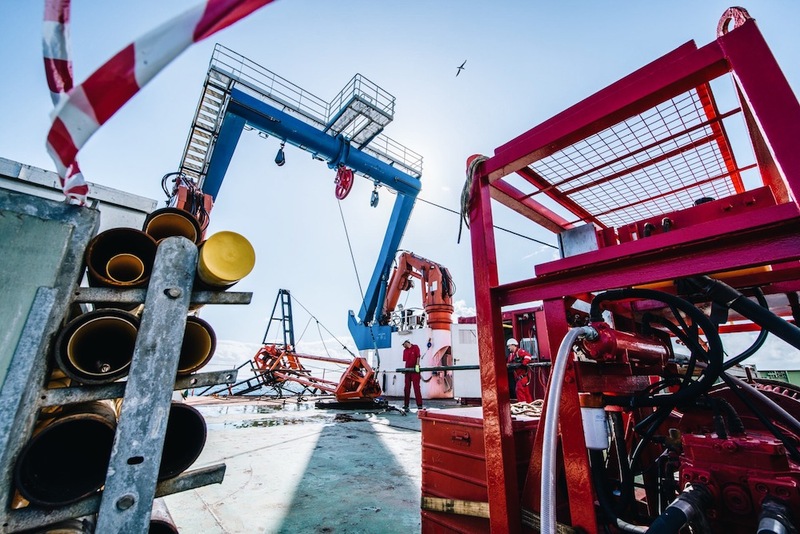 We have two coring systems on board, a percussive vibrating corer that can sample down to 6 m below the sea bed penetrating the tough materials laid down beneath and in front of former glaciers, and a gravity powered piston corer capable of sampling up to 18m in softer sediments. Our aim is to find shells in these glacial sediments to radiocarbon date and work out the timing of deglaciation. 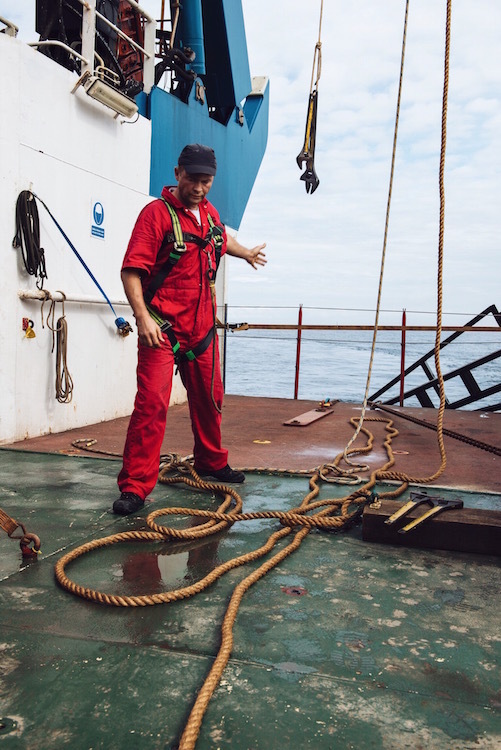 The success of the efforts for both our cruises relies on the excellent 24 hour work ethic, diligence and company of the cruise team, science crew, BGS and NOC Piston coring teams and the RRS James Cook captain and crew, all of whom do everything they can to help us. The middle 2-3 days of T8 were particularly nerve-wracking as the BGS crew toiled night and day to fix a particularly truculent problem with the vibrocorer, part of the solution to which lay in finding and removing an electrical break in the 1500 metres of cable that winches the BGS vibrocore to and from the sea bed. 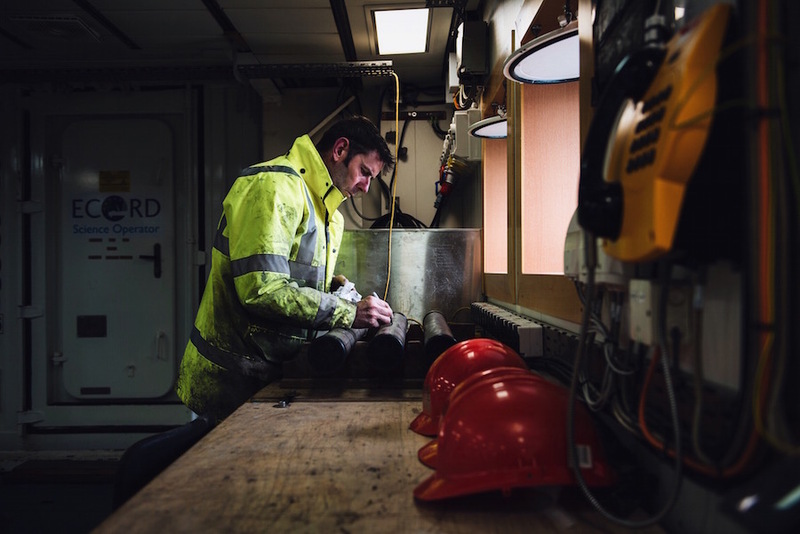 Thankfully time was spent obtaining important piston cores in the inner Minch and collecting valuable geophysical data, as the BGS team worked around the clock. 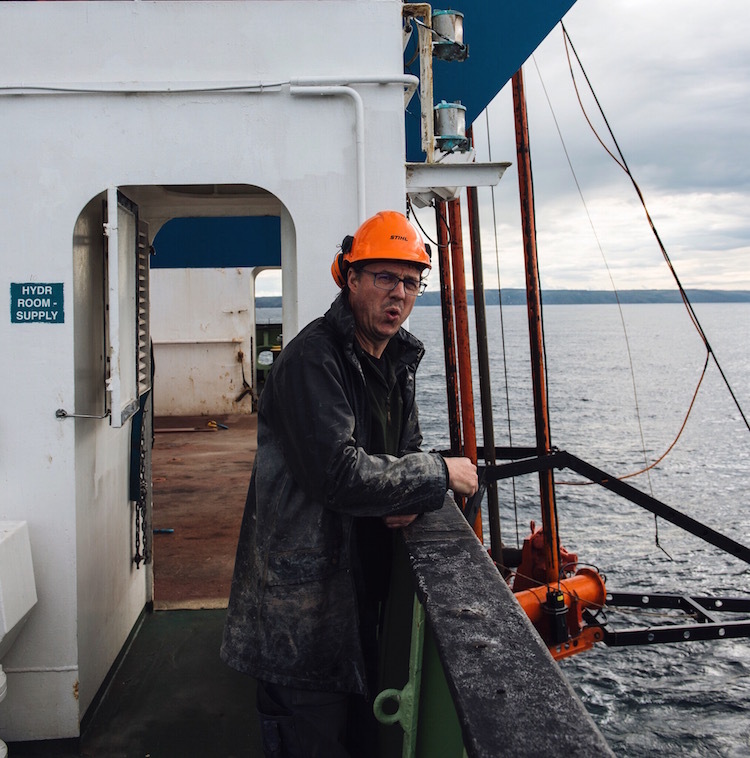 As ever in Britice chrono’s experience, the BGS team, had everything needed on board to solve the problem, and cheers greeted the announcement of ready to go, and there followed ‘an in at the deep end’ test of the repair in 500-600 metres of water off the continental shelf fronting the Minch ice stream. Success, with 4.14 metres of glacimarine muds recovered, and on leaving the waters of T8 a further 11 vibrocores were recovered containing the key shell-rich glacimarine and subglacial muds our project requires. Looking back on the Minch experience, it is certainly one of the prettiest (former) ice streams we have worked on during the Britice-Chrono cruises, with land in view and visiting the Inner Hebrides passing the Isles of Skye, Lewis/Harris and Raasay amongst others. The leg has been a considerable success, we have collected 1292.6 km of geophysical data (multi-beam and sub bottom profiler), 51 sediment cores (39 vibrocores, 12 piston cores) and 177.2m in vertical sediment profile; who said the Minch was a small ice stream? Our travels have taken us from Raasay Sound in the south over the edge of the continental shelf at 59° 15’ N, and into near shore waters fronting Cape Wrath and the Summer Isles. 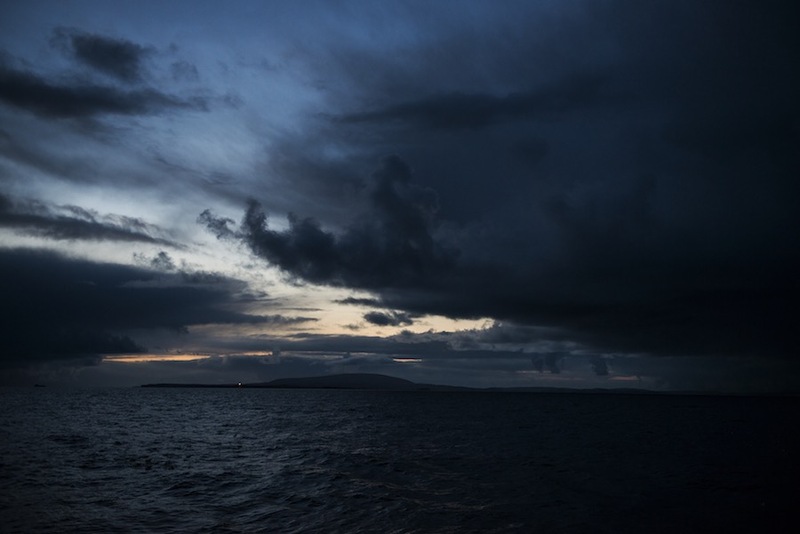 The answers to the Britice-Chrono geochronological questions must wait on many months of laboratory analysis, but we leave the Minch with all teething troubles behind us, and a growing bounty of cores in the locker. We are ready for the delights of Shetland…! This entry was posted in Marine geology specific issues, Uncategorized and tagged briticechrono, Cruise, glaciation, Hebrides, Marine, marine sampling, multibeam, RRS James Cook, The Minch, Transect 8 on July 13, 2015 by briticechrono. Here we go, here we go, here we go, HERE …WEE …GOoooo….. The RRS James Cook, towards the end of mobilisation. Just the ‘Vibrocorer’ is left standing proud on the dock – ready to be lifted into position. The Royal Research Ship (RRS) James Cook gets ready for her geophysics and coring cruise as part of BRITICE-CHRONO’s investigations into the speed of ice sheet retreat. Just back from Mexican waters she needs to prepare for the North Sea and the continental shelf and fjords of northern Scotland. Our resident filmmaker for the cruise, Alex Ingle, has captured the mobilisation process. Witness much dockside crane-work at the National Oceanographic Centre in Southampton, loading the drilling rigs (vibro- and piston corers) and containers of kit including our impressively-refurbished containerised core scanning laboratory, which comes complete with scientist Sally Morgan. So much deck manipulation was required that a small ‘cherry picker’ was craned onboard for the delicate manoeuvring. Food and water for a one month journey also made it onboard, although I noted at breakfast this morning that we are drinking bottled water from Mexico, very nice too. Mobilisation of the science team was much easier, with 25 of us travelling by train, plane, and automobile and climbing the steep gangway. This brings the ship’s complement to 52, all of whom are ready for a voyage of some discovery. Colm is our captain of science for the trip (Principal Scientific Officer) and is hoping for a nice and steady start to our adventure. For me, the long-awaited cruise started on my birthday, very fitting timing and more so because it was also on my birthday, high in the Italian Alps, that I first learnt that our BRITICE-CHRONO project got the go-ahead when NERC chose to fund it. Clearly a precedent has now been set for sizeable scientific treats on my birthday that I hope to enjoy in the future years. I am just back from a marvellous lunch, with stop-press news, we have now run out of Mexican water, our new supplies are from Conwy in North Wales. The science team watch on in anticipation as the Vibrocorer is lowered into the water for the first time this cruise. So we finally set sail 9am Friday 3rd July, setting off on a 3 day transit up the east coast of England and Scotland, through the hazardous Pentland Firth, westwards across Scotland’s north coast to our first target cores near Cape Wrath. Let there be shells of treasure in them there cores…….. This entry was posted in Uncategorized on July 5, 2015 by alexingle.